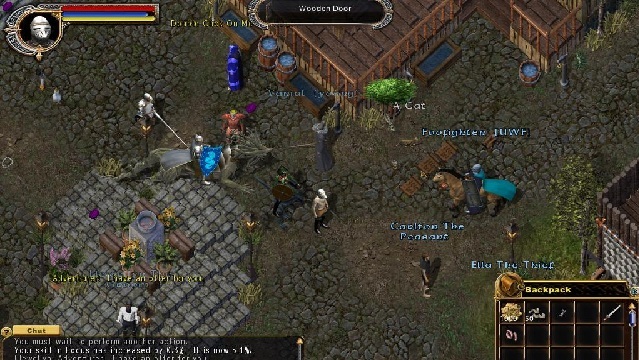 While not the first massively multiplayer online RPG, it is the one that coined the term and elevated the genre to the monstrous institution that it is today. Ultima Online was nothing short of jaw-dropping when it was released in 1997, allowing thousands of current players to be on a server at any given time as they collected resources, forged equipment, formed factions, went on quests and upheld a massive virtual economy. Hell, you could even build houses if you wanted. The game is still active to this day and still receiving content updates and patches, though it is obviously nowhere near as popular as it was in its heyday. There are also several free servers up around the 'net if you want to check out a copy without paying for a monthly subscription; these also generally run on older versions of game code, allowing players to recreate the experience of the game from the late 1990s or any era in between. Two sequel games (Ultima X: Odyssey and Ultima Worlds Online: Origin) were planned and partly developed in the early 2000s, but were ultimately cancelled. More recently, Richard Garriott launched a successful Kickstarter campaign to fund a spiritual successor called "Shroud of the Avatar: Forsaken Virtues," which is in pre-alpha as of this writing.